A lot of people ask me 'does it get easier or harder as they get older?' and I will never lie about parenting. The answer is a yes and no really. I'm going to talk about Mia mainly because she is the eldest so I've seen her change much more in the past 5 years. Looking back to when Mia was a newborn and even a toddler I think I would prefer the newborn cry or the toddler tantrums instead of the horrible attitude I get sometimes. They know a lot more words at 5 years old and they can answer back to everything. They don't care what you say or tell them they will still carry on their attitude if they are in that 'mood' and I do find it a lot more stressful. Yep, 5 year olds still have tantrums and sulking times. It can be really stressful at times. Sometimes Mia will go through a phase of kicking and hitting me but luckily that hasn't happened for a while now as she used to be really bad at doing it. Even though I do find it really hard to cope and very stressful when Mia goes through her sulking and tantrum stage I think I find Elliw a little bit harder because she is a bit stronger and she will just throw herself on the floor and scream the place down. As they get older they want to do more things themselves. They don't want the parent to help them as much as before and this is where we see that our little child has grown. It is weird seeing your child getting dressed by themselves, writing, colouring well and just doing a lot more things themselves. That is when it is a bit easier than when they were younger. They are just happy enough to do things themselves (sometimes). Children grow up too fast and it is us that learn them the right from wrong, although that can be hard to because children are right about everything (atleast they think they are!) *sarcasm*. I think it will get harder as they get older, we got more things to learn them and I think a lot more arguments and answering backs! One thing I can't wait for when my girls are older is going shopping and having a mother and daughter time with them both. 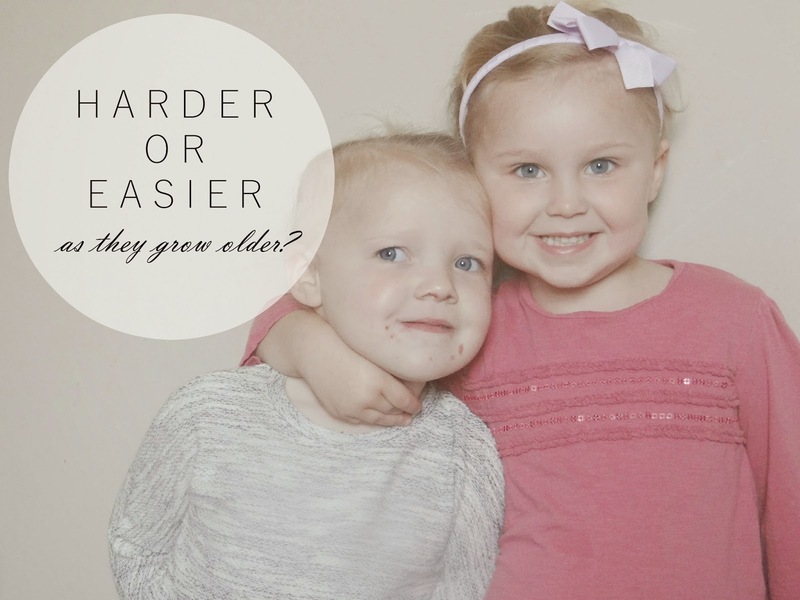 Do you think it will get easier or harder as they grow up? * Please note - I have only written this based on my own experience. I have not written this saying that every child at 5 years old is like this. Every child is different and show their tantrums differently. If you do have any worries or problems about a child's behaviour or any other worries, as the Health Visitor or Doctors. Certain things get easier as they become more independent, but certain things become harder, like keeping their behaviour and attitude in check. My daughter is 9 and on the whole she is a good kid, but I know that as she starts getting hormones then it will be another ball park altogether.